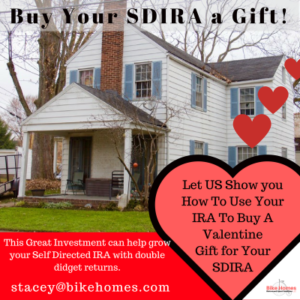 In honor of Valentine’s Day, we wanted to talk about how you can use your IRA to give yourself a special Valentine’s Day present. Do you have an IRA with your job? Have you left a job recently and started a new job? Have you retired? Do you have a savings or retirement plan? Would you like to earn double digit returns in your savings account? Would you like to retire someday? If you answered yes to any of these questions, then I encourage you to read further or check out our latest Dining Room Table Talks for Note Investors on YouTube. Did you know can transfer an IRA or savings account into what is called a Self Directed IRA (SDIRA). A self-directed IRA is one that allows the account owner to invest their IRA dollars in what they feel is best. It is free from the investment restrictions imposed by the more traditional brokerage style accounts. An IRA with a traditional custodian limits your options for investing to things like stocks, bonds, and mutual funds. You can use your SDIRA to invest in a multitude of things including promissory notes backed by real estate. There are several types of SDIRAs such as Coverdell Education Savings Account (CESAs), Roth, or Simple SDIRA. You can even self-direct a Health Savings Account (HAS). A self directed IRA can help your investments grow on a tax-deferred or tax-free basis. The type of account you choose depends upon your personal situation. Using this SDIRA, you can then invest in promissory notes backed by real estate and safely achieve double digit returns. Now I ask you, do you know what returns you are getting in your Traditional IRA or savings account? Well, I can bet it probably isn’t in the double digits. We recently did a talk on Savings and CD returns, so be sure to check that one out on our YouTube channel. Remember that your SDIRA is still a retirement account so if you use it to purchase real estate or promissory notes, all expenses and profits/earnings must come from and go back to your IRA to build for your future retirement. Since your investment is backed by real estate which you control, you are not prone to fluctuations in the stock market which you have no control over. So, how do you go about setting up a Self Directed IRA? The easiest way to get started in a SDIRA is to use an IRA from a previous employer. You can set up an account with one of the various self directed IRA companies which we can help you with. Once you have your account set up you then transfer funds from the previous employer’s IRA account. Another way to move funds is if you have a personal IRA, you can transfer those accounts into a Self Directed IRA. Finally, you can start a Self Directed IRA with extra money you may have maybe from a savings account or a CD coming due and let that continue to grow. Once your funds are in your SDIRA, you can pick your investments, promissory notes backed by real estate notes being an option that offers great returns which are typically higher than those you receive through traditional IRA investment accounts. If you are interested in learning more about how you give yourself an extra special Valentine’s Day present this year, please drop us a line at Stacey@bikehomes.com. You can also reach out to us on our website or connect with us on one of our Social Media accounts.